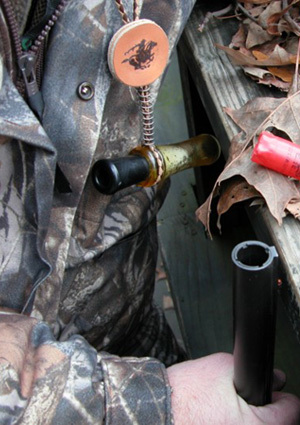 Choking or “constricting” the muzzle end of a shotgun barrel to tighten patterns and extend range might be the most significant improvement in shotgun performance since scatterguns were created. Before choking, all barrels were straight tubes, cylinder-bored, and about 25 yards was all you could be confident in as a kill zone. Around the late 1800s, a lot of people were playing around with ways to tighten patterns and extend range, but most credit an Illinois duck hunter named Fred Kemble with the technique, although he did kind of figure it out by accident. Seems he was trying to constrict the barrel of his big 10-bore by squeezing down the area at the muzzle. Resulting patterns were worse than ever, so he wanted to give up on the idea. He tried to bore out or drill the constricted area back to the straight cylinder-bore. When he was done, the gun shot tighter patterns and held them farther than it ever had. He measured the bore to see what was up and discovered he hadn’t quite reamed it all out. He had left just a wee bit of constriction in, and choke-boring was discovered. The surprise, it seems, was in just how little internal taper or constriction is needed to affect the shape of the charge exiting the bore. For example, a 12-gauge cylinder bore, with no constriction, measures on average .730 inch. Improved-choked bores measure .721, modified .712 and full .694. A reduction of only .036 inch brings the pattern from wide-open, cylinder-bore for close shooting of quail to full-choke for reaching way out for passing ducks. Not much, but, as Fred Kemble discovered, it doesn’t take much. Shot Constriction: How Much And How Fast? Let's take the .036 reduction from cylinder to full in a 12-gauge. Should it happen over a 1-inch length or over 3 inches? Should there be a substantial length of the constricted area, or should it abruptly end at the muzzle? These choices created an entire industry for making choke devices, from removable, screw-in tubes to fully adjustable replacement muzzles that can be varied from cylinder to extra-full by simply twisting the end. Every maker has a theory. Shotgunners have been blessed by the introduction of heavier-than-lead, high-performance shotshells and some radical new wads. You will be missing maximum performance, however, if you don't pair them with the correct choke. The introduction of tungsten-based loads sent us back to the drawing board to rethink much of what we thought we knew about shot size, shape and choking. Hevi-Shot, for example, defies the premise that shot must be uniform in size and shape to pattern well. It’s full of multiple sizes and misshapen pellets, yet it patterns beautifully. Choking tungsten loads also breaks from tradition. In my testing, all tungsten patterns are at their best when not overly choked. Most guns I tested did best with a modified, improved modified or, occasionally, full choke. Extra-full chokes designed for lead or steel with constrictions of more than .030 would create big holes in the patterns. Additionally, many felt the harder-than-lead tungsten (or steel) loads would mar the insides of delicate barrels and chokes and cautioned against using it in "fine" shotguns. Having said all that, the new Hevi-Shot choke tubes made by Carlson Choke Tubes both verify and dispute my findings. Carlson has introduced three new choke tubes for use with Hevi-Shot, as well as lead and steel. Hevi Turkey: This is a knurled, ported tube with a .030 constriction for long range. Hevi Waterfowl Jump and Pass: This model is a modified equivalent with a .020 constriction. It’s for working over decoys or jump- and pass-shooting. Hevi Xtreme: This choke defies my finding, but is claiming impressive results. It's an extra full with a whopping .060 constriction, yet the company claims it will deliver over 90-percent pattern with Hevi-Shot at 40 yards. That’s 380 out of 420 pellets into a 30-inch circle at 40 yards! I have not had a chance to verify this, but it’s extraordinary performance with any load. New wad technology, as well as new shot material, also forces us to rethink our choke selection. Federal’s Flite Control wads have a shot cup that opens from the rear, not with petals that open from the front as with standard wads. Federal’s new tungsten Mag Shok loads and their Black Cloud steel are extremely effective out to 50 yards and beyond, but choking any loads with the new Flite Control wads requires unique thinking. Ported chokes, those with recoil-reducing slots, will not work with the Flite Control rear-opening wads. The Flite Control wad in action. For the tungsten Mag Shok or the Ultra Steel Black Cloud, several new chokes from Carlson are best for maximizing performance. Carson 12-gauge Titanium-coated Black Cloud/Mag Shok chokes come in two restrictions: the Long Range at .030 and the Mid-Range at .020. Another revolutionary new wad, the TurboJet wad from Remington, is pushing steel loads to an unheard of 1,700 fps, but like the Flite Control from Federal, it might take a bit of experimenting to see how to best choke TurboJet-powered loads. As of this writing, none are yet available for testing, but when we get them, you’ll read about it here first. In the past, all you needed was a little squeeze to control your pattern, but with the new wads and shot material, choking has become a fine art. Master it and you will be amazed at the effective range.